After feeling a little bit stressed out by crowds in Dublin, a 4 night stay in Belfast at City Backpacker Hostel turned out to be an absolute gift. It really did feel like a home away from home in so many ways. Of all the hostels I have stayed at to date, it’s City Backpacker that has done things best. The truth is that in hostels, it’s the little things that make the biggest difference. There are simple things that can be done to a dorm room that make everybody happy. If a hostel fails to do those little things, it can, and should, cause complaints. The owner of the hostel, John, will do absolutely everything he can to make sure that you get the most out of your stay and that you are as comfortable as possible. You can’t go wrong with a stay here. Queen’s University of Belfast, just down the street from City Backpacker. The majority of the rooms are dorm rooms, and most have en suite bathrooms. The dorms are nice and open and have large windows that allow lots of light in. The beds all have lockers at the bases to put your valuables in. I can’t believe how many hostels in the UK don’t have any sort of lockers available in the rooms, and then put up signs saying not to leave valuables in the rooms. What are we supposed to pack our gear around with us everywhere we go??? City Backpacker got this one right. If you want a private room there is only one. The private room is awesome, and where I was allowed to crash during my stay. 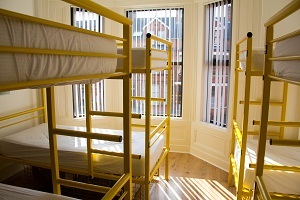 The private room with en suite is at the top of the hostel and makes brilliant use of space. The double bed, with the most comfortable mattress in history by the way, is places on stilts above an area with a couch and table. The area is perfect for a couple. At first glance I thought that the location of this hostel was going to be a bit of a problem as it is about a 15 minute walk from the city center. However, it turns out the location is actually an advantage. The property is up by the Queen’s University of Belfast in a student area of the city. As such, there are plenty of pubs, restaurants and cafes in the area. You are also up near the parks and botanical gardens. If you want to get downtown the walk is nice or there are regularly running buses just down the street. In all honesty there is nothing really missing. Internet: There is free wifi throughout the building, even in the rooms. I was on the top floor and I still got a prefect connection. There are also a couple of computers to use in a common area. Kitchen: The kitchen is decent. It has two ovens and a couple of sinks, and there is plenty of space to cook. There is also a nice little dinning area just outside the kitchen. The only small issue of the kitchen is that there is no freezer yet, so make sure nothing needs to be frozen. Breakfast: Breakfast is included and involves toast and cereals as well as tea and coffee which are actually available all day long. TV and Entertainment: There is a big screen TV and a bunch of DVDs on site. There is also a foosball table. Lockers: As I mentioned, there are lockers available in the rooms so there is no need to worry. You can put a deposit down for a lock as well if you need one. Towels: You’ll have to rent one if you don’t travel with one, but it will only cost you a pound. Laundry: For just 3 pounds per load they’ll do your laundry for you here at the hostel. Tours: There are no tours run directly by the hostel however they can organize anything for you. My recommendation is to do the Black Cab tour, which is amazing. I usually have a bit of a rant about something in this section don’t I? However, there’s nothing really to rant about the City Backpacker property. The location might be an issue for some people who want to be in the city center. However, I really the location as it felt a little bit more relaxed and real. Yes, I’m adding a score tally to my reviews now. Out of 100 I give the City Backpacker hostel a 92. If this hostel was in the city center it would easily get 100. Stay away from the chain hostels, give this place a shot! You can see reviews from other backpackers, more pictures, and get more information including booking information here.